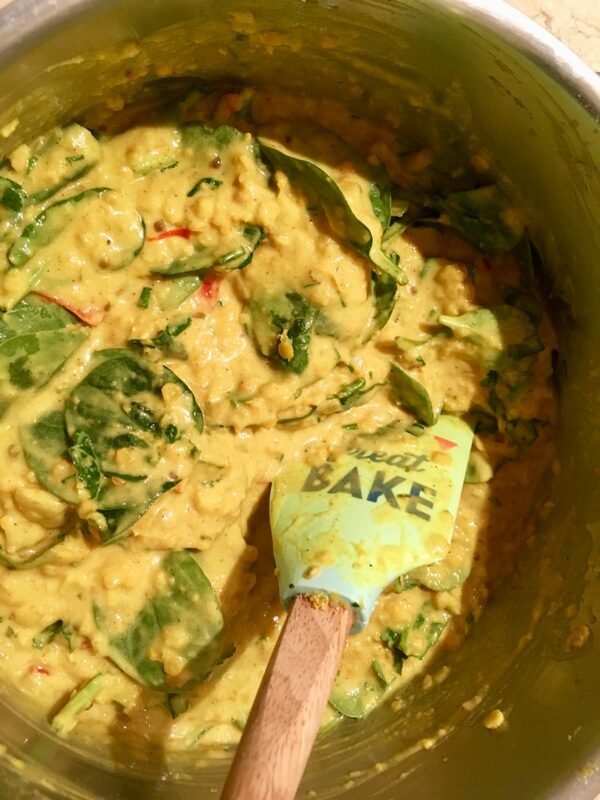 This is a killer dhal recipe. The roasted vegetables and rose-coloured coconut chutney turn it into something stellar and all from the humble little lentil. You can use a variety of roasted vegetables but I prefer to use either sweet potatoes, carrots or butternut squash. But let’s not get too precious, any roasted vegetables will be just fine. For the chutney, fresh grated coconut is best but I don’t often have time to source it, so feel free to use unsweetened desiccated coconut. Equally, if you’re short of time, this chutney can be swapped for a good spoonful of mango chutney. Though, to be honest, I like to serve it with both! 1. Preheat your oven to 220°C/fan 200°C(425°F/fan 400°F)/gas 7. If using desiccated coconut, pour 150ml of boiling water over it and leave to soak. 2. Put the sweet potatoes/carrots etc on a roasting tray and add a good pinch of salt and pepper, the cumin and fennel seeds and a drizzle of coconut oil. Roast in the oven for 20–25 minutes, until soft and sweet in the middle and crispy brown on the outside. 3. 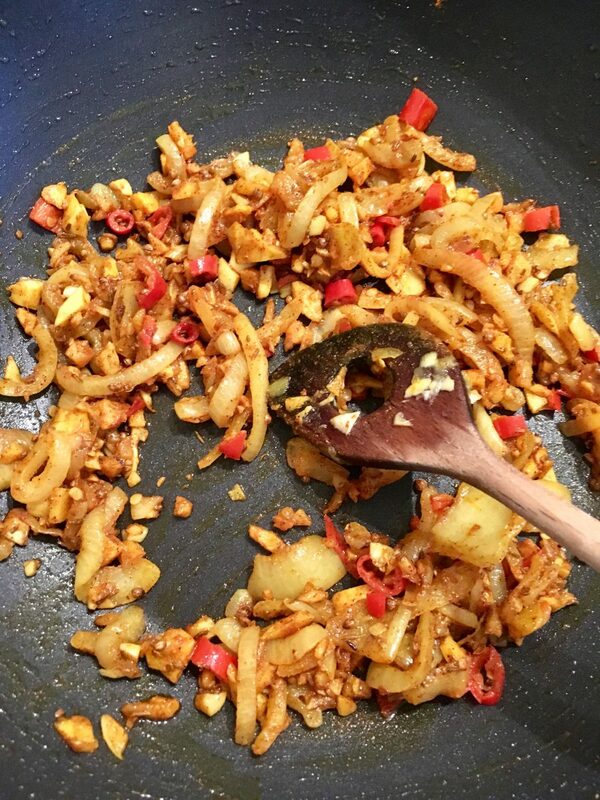 In a large pan, fry the garlic, ginger, chilli and onion in a little oil for about 10 minutes over a medium heat, until soft and translucent. 4. 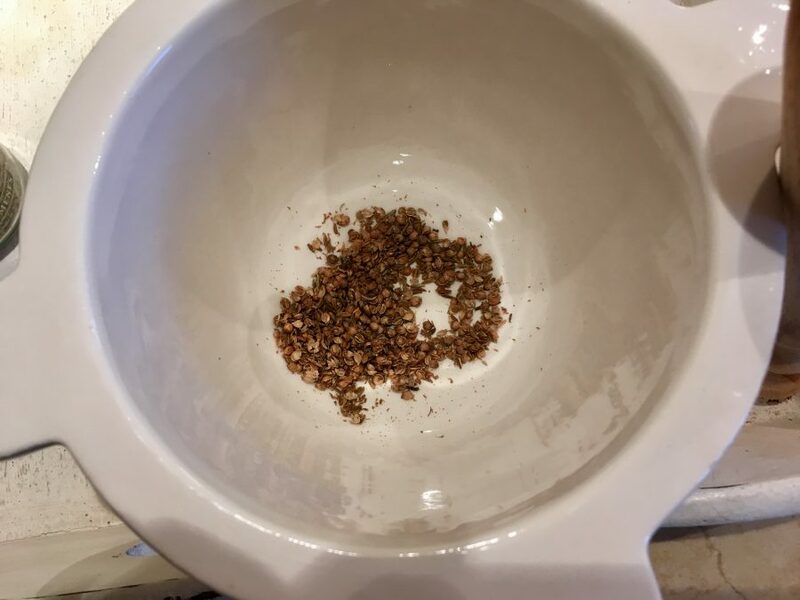 Grind the cumin and coriander seeds in a pestle and mortar, then add to the pan with the other spices and cook for a couple of minutes to toast and release the oils. Add the lentils, coconut milk and stock to the pan and bring to a simmer, then turn the heat down and allow to bubble away for 25–30 minutes. 5. While that’s cooking, make the chutney. Drain the coconut and put it or freshly grated coconut into a bowl. 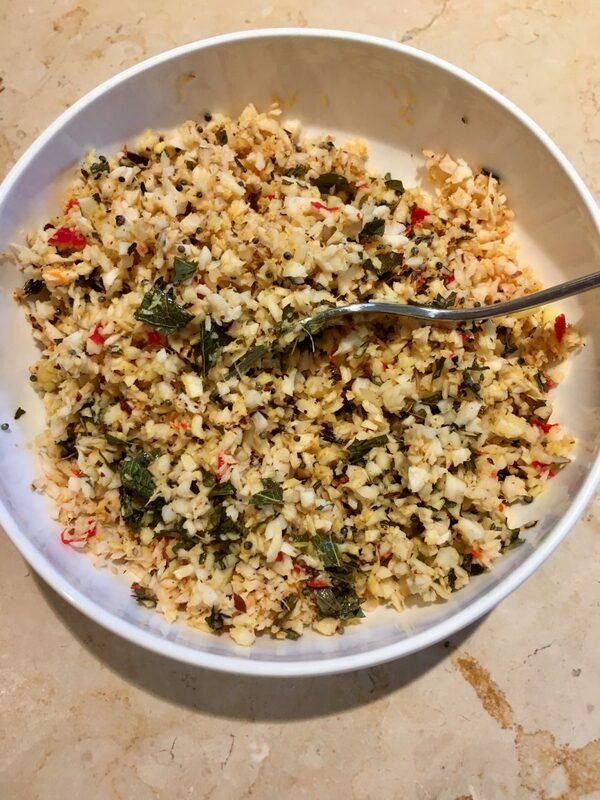 Fry the mustard seeds and curry leaves in a little oil until they begin to crackle, then pour the mixture over the coconut. 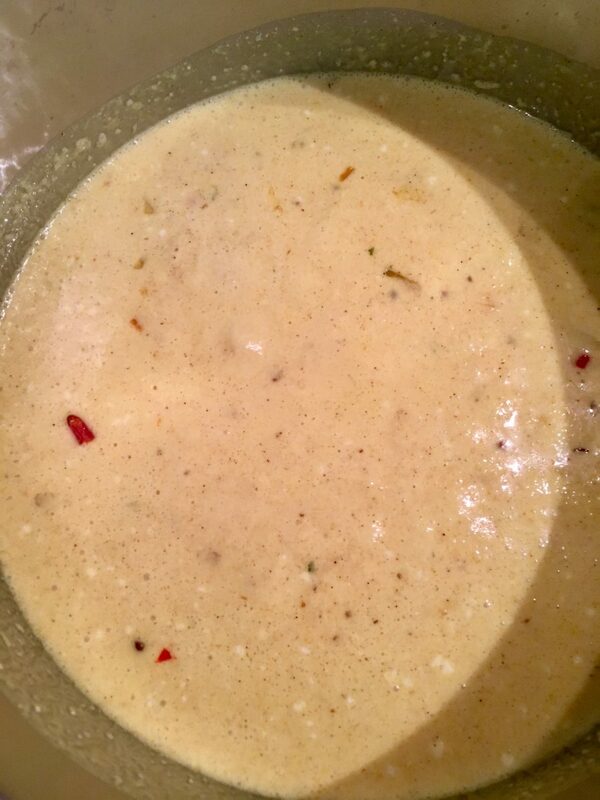 Season with salt and pepper, then stir in the ginger and chilli and give it a good stir. 6. 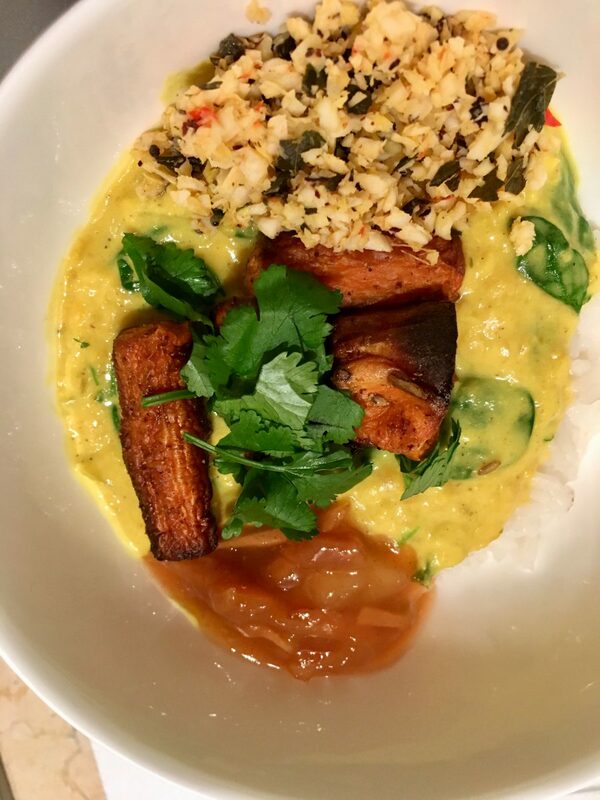 To finish the dhal, take it off the heat, stir in the spinach and allow it to wilt a little, then add half the chopped coriander, all the lemon zest and juice. 7. 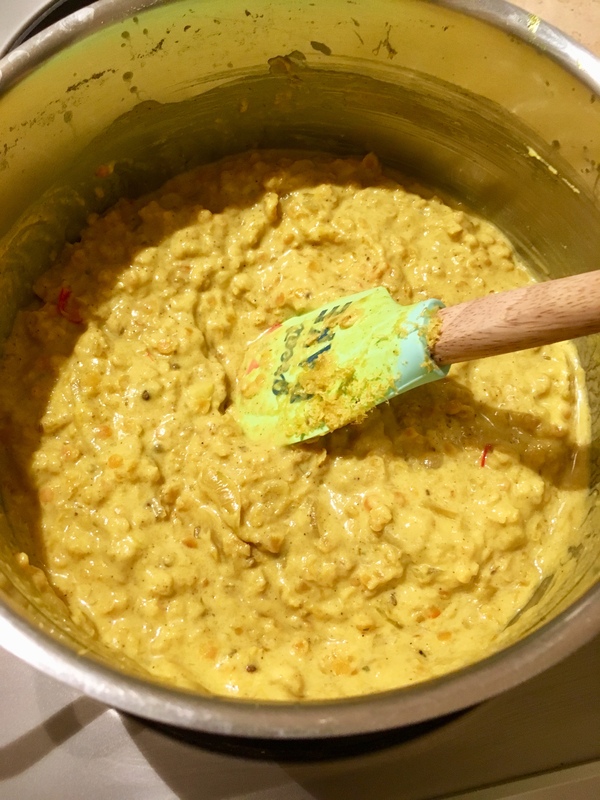 Pile the dhal into bowls and top with the vegetables, the coconut chutney, the mango chutney and the remaining coriander. 8. 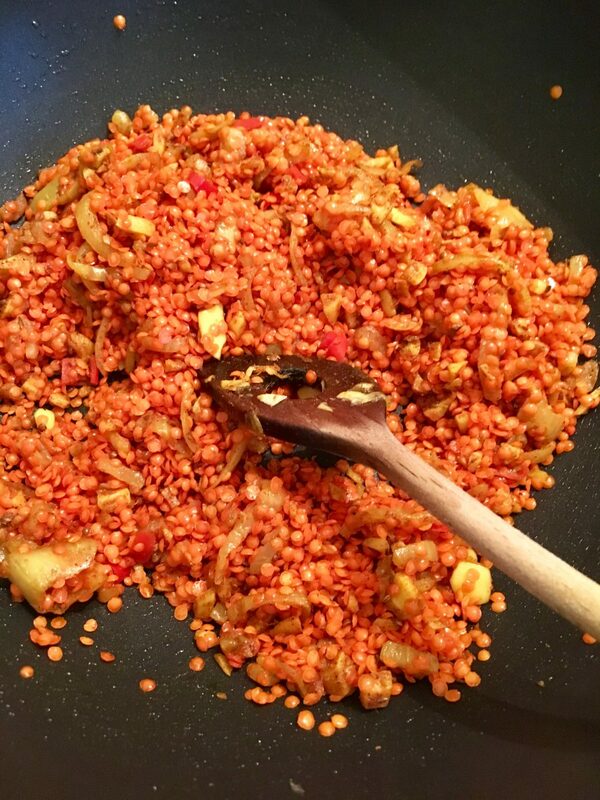 Serve this with an Indian bread such as naan, chapattis or roti and, if you’re really really hungry, some fluffy brown basmati rice. Thanks! It is pretty yummy. J’ai le faim maintenant! Merci pour rien. Et je suis manger le dejeuner.